To take a lump of clay and transform it into an object is a wondrous process. No kiln? No wheel? No problem! 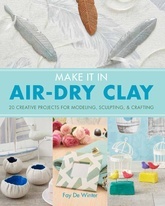 With accessible and easy-to-find air-dry clay, you can easily make beautiful trinkets, jewelry and a never-ending range of other decorative items. This colorful how-to guide covers all the basic techniques-including pinching, coiling, creating slabs, making sprigs, decorating surfaces and sealing and finishing-as well as a variety of pretty and simple projects. Choose from customized gift box adornments, elegant feather tags, festive hanging stars and snowflakes, impressed trinket dishes, a miniature mirror, sculptures, planters, pea pod bowls and rings, necklaces, bracelets, brooches and much more. Fay De Winter is a London-based ceramicist who has a BA in ceramic design from Central Saint Martin's and an MA in contemporary craft. She has participated in many events and exhibitions in England, China, Japan, Bali and the USA. This is her first book.